Many large institutional asset managers expect developed stocks to march higher next year. They predict that companies will ramp up capital expenditure and fiscal policy will become less restrictive. That may well happen. The risk is that too much money is chasing the same idea. Crowded trades are rarely safe bets. This year, U.S. and European business investment has been decidedly sluggish but fund managers expect it to rebound strongly in 2014. That is quite likely – Charles Schwab research shows the average age of U.S. manufacturing plants, equipment and software has risen to all-time highs. If economic gloom continues to lift, it is likely that they will find the confidence to spend again. Raised capital expenditure will help equities, particularly the share price of companies which produce goods. Equities look like one of the more obvious picks for 2014 given core U.S., German and British government bond markets look set to suffer when the Federal Reserve eventually trims its asset purchases. And if the central bank moves more slowly than anticipated, stocks will be just as likely to benefit as bonds. But with so many fund managers bullish on equities, and for the same reasons, the trade may become crowded very quickly. If bond yields also continue to rise, as funds expect, elevated stock prices will erode the equity risk premium, a measure of the relative appeal of stocks versus bonds. The size of the equity risk premium for developed stocks is already about a third below its 2012 peak and roughly 1 percentage point away from its long-term trend, according to Societe Generale models. Corporate earnings growth may support equities. But this year’s double-digit rally in U.S. and European stock markets has boosted price-earnings ratios above their 10-year averages on both sides of the Atlantic. The more money that floods into developed stock markets, the more challenging valuations will become and the less scope there will be for stock price gains to outstrip earnings growth. Stocks may rise next year. But the party is likely to be less exuberant than the one investors enjoyed in 2013. 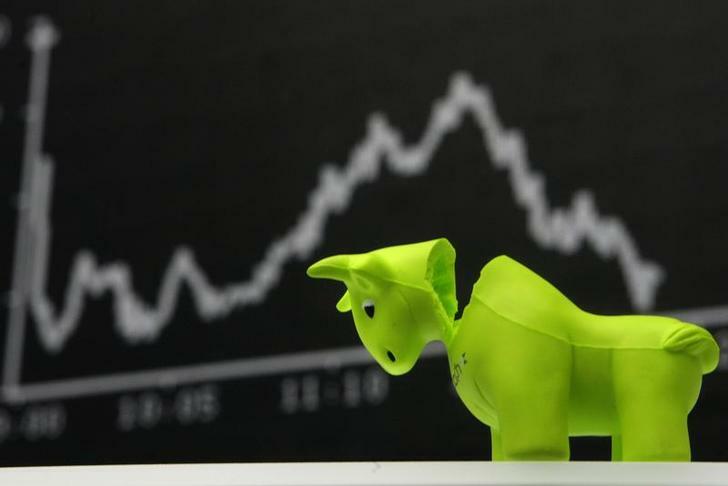 A bull styrofoam figure is pictured in front of the DAX board at the Frankfurt stock exchange September 16, 2008. The S&P 500 has risen 22 percent so far this year while the FTSEurofirst 300 has climbed 14 percent. The 12-month forward price-earnings ratio for the S&P 500 is 14.9, Thomson Reuters data shows. That compares with 12.9 at the beginning of this year and the 10-year average of 13.9. The price-earnings ratio for European stocks is 13.4, which compares with 11.4 at the beginning of 2013 and a 10-year average of 12.